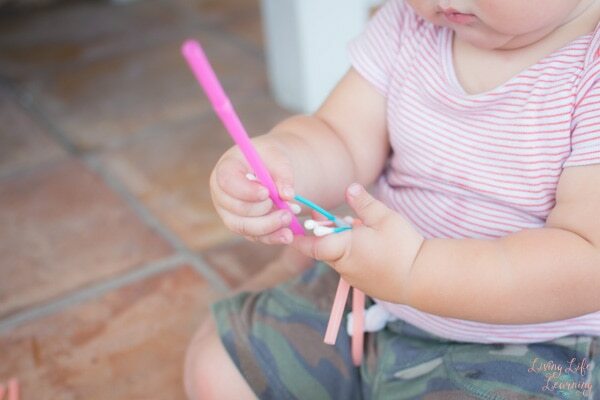 We love quick and simple sensory activities at our house, and as a bonus, this one doesn’t make a mess and is easy to pick up: Toddler Play with Straws and Cotton Swabs! 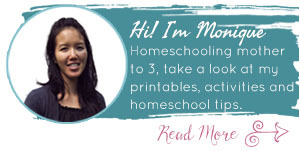 It’s a classic toddler boredom buster with simple materials that you most likely have on hand right now, takes a minute to set up, and is engaging for your toddler – just all around a great little activity! 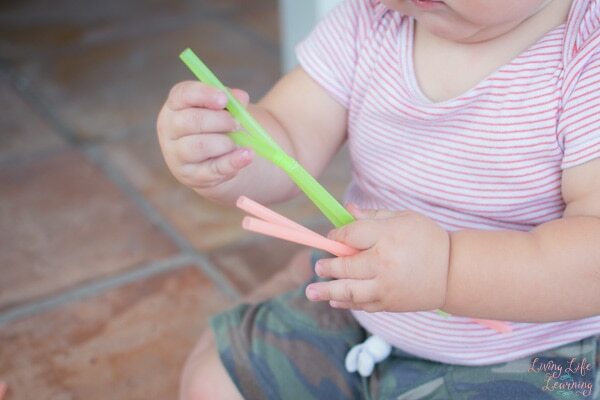 A handful of straws, bonus points if you have brightly colored ones. A handful of cotton swabs. It really was as simple as it sounds. I put a big handful of straws and a big handful of cotton swabs into our shoebox-sized sensory bin and stepped back to let my son explore. 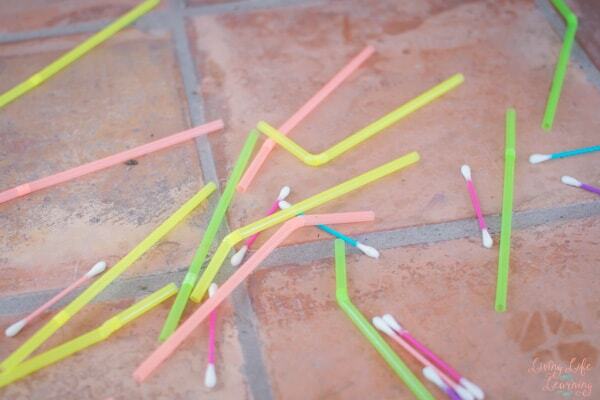 He reached right in and grabbed straws and cotton swabs by the handful, dropped them, and picked them up again. 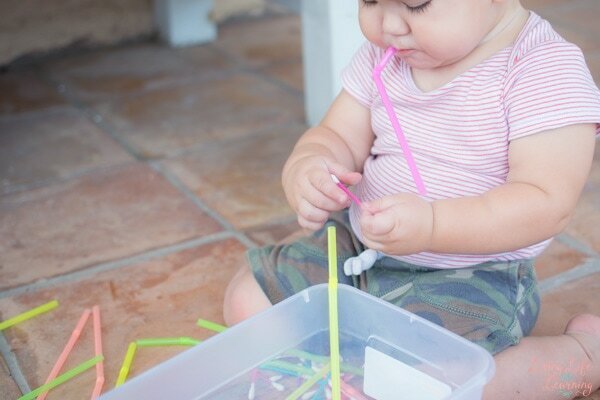 He spent some time exploring just the straws. 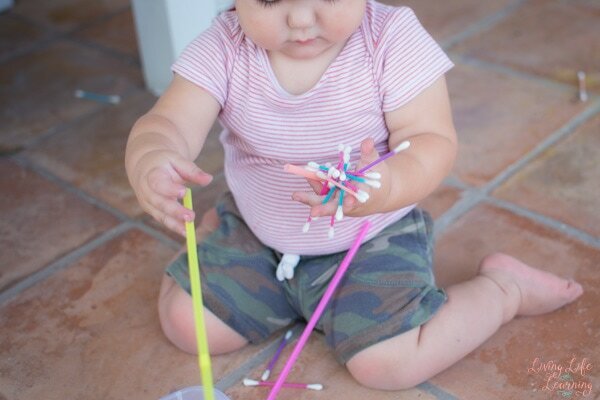 After he’d explored the cotton swabs separately, he decided to try how they fit together. I was impressed that he managed to fit the cotton swab into the straw. He wasn’t able to get it all the way in, though, and I showed him how to do it. He quickly lost interest in this, however. Handfuls of straws and cotton swabs kept his interest for quite a while, though. He didn’t put the materials back in the bin, but it was really easy to pick them up again. If your toddler enjoyed this quick and simple activity, he or she may also like to try Toddler Paint with Flour Paint, Flower Sensory Soup, Fine Motor Activity with Straws and Pipecleaners, or one of these Spring Toddler Activities. Or you may want to make your child some DIY toys with these fabulous Fruit Felt Craft Ideas! 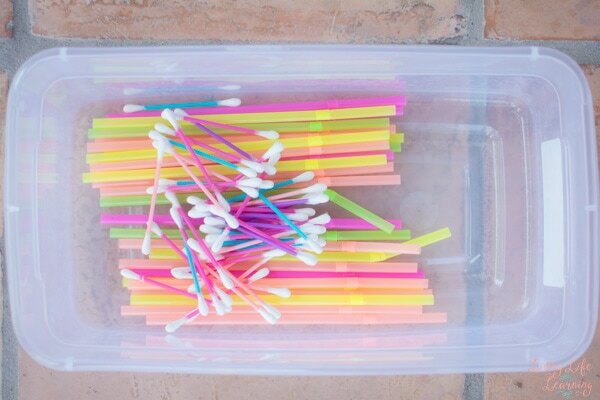 Try cutting the straws a little shorter than the cotton swabs. 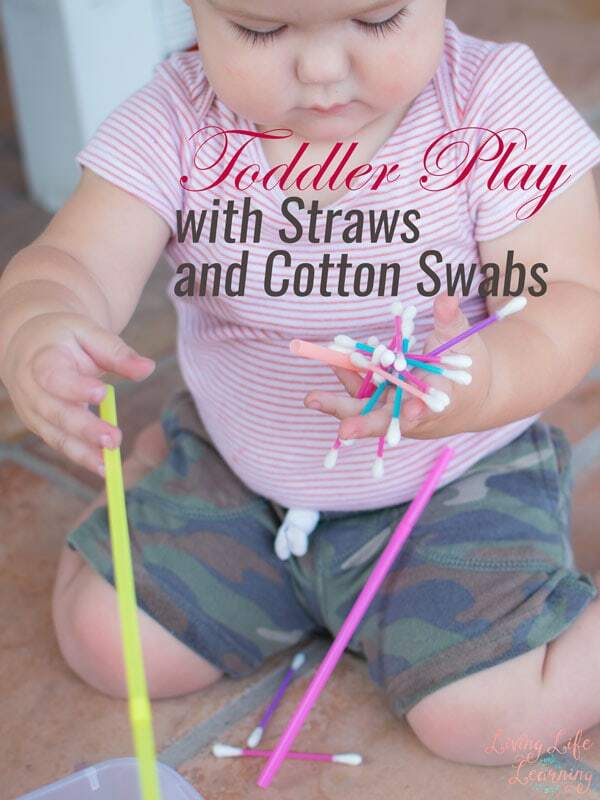 Toddlers love putting the swabs in the straw. And builds their hand eye coordination and they also get excited wen they see the swab coming out from the otherside of the straw.